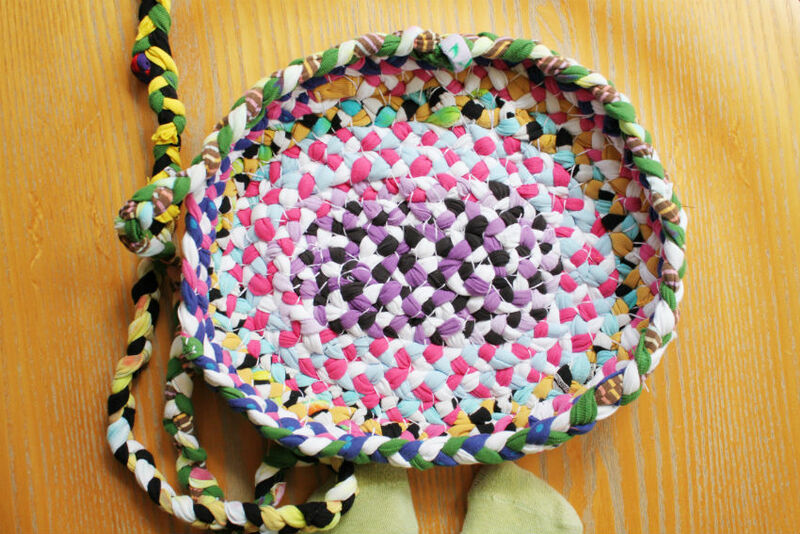 My friend Anna and I recently made a braided basket for a classroom art project at our daughters' school. We had all the students make polymer clay beads and each donate an old t-shirt. We braided the t-shirts along with some extra jersey fabric we bought, threading on the beads every 18" or so, then sewed the giant braid into a basket (Anna did the braiding, I did the sewing). Time consuming? Absolutely. But it was a sweet piece that did pretty well at our school auction last weekend. We used about twenty child-sized t-shirts and a yard of jersey, but you could use as little or as much material as you want, depending on the size basket you are making. Cut the jersey fabric and the t-shirts into similarly sized strips, around 2-2 1/2" wide. You will get the most out of the t-shirts from the torso area, yielding 3-5 strips from each t-shirt. The jersey strips should be a yard long. 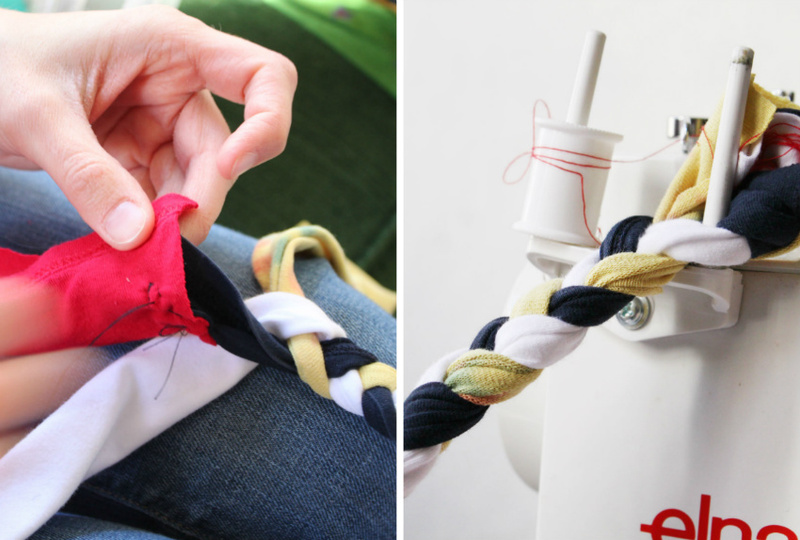 Baste stitch three t-shirt strips together at a time to form longer pieces. Do as many of these as you can manage until you think you have what you need. I spent about three hours doing this with the 20 +/- t-shirts we used. 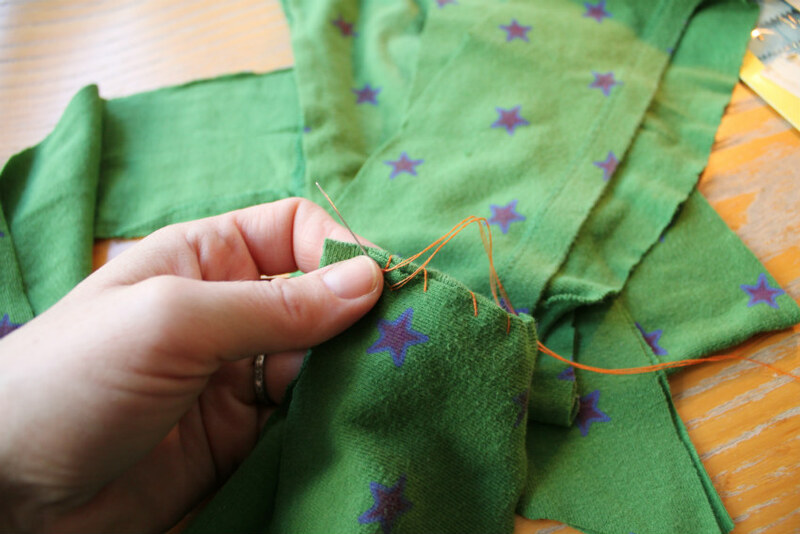 Don't sew more than three smaller strips together at a time, as anything longer than that will be difficult to braid. 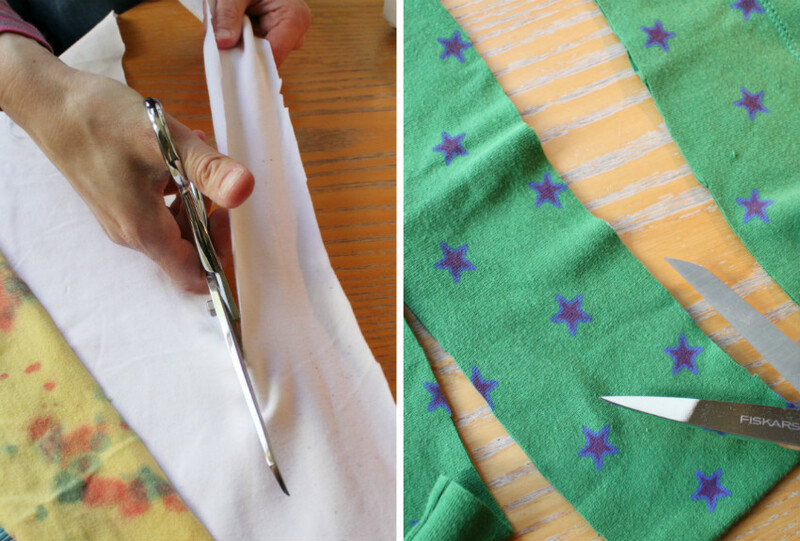 Sew the ends of two different t-shirt strips to the end of one of the jersey strips. 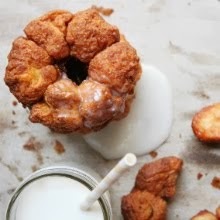 This will be the top of your braid. Secure that end to something stable (we used the spindle holder on the top of a sewing machine) and start braiding. As you come to the ends of the t-shirt fabric pieces, attach new pieces to the old with a quick stitch or two so you can continue braiding. Same goes for when you reach the ends of the longer jersey pieces. 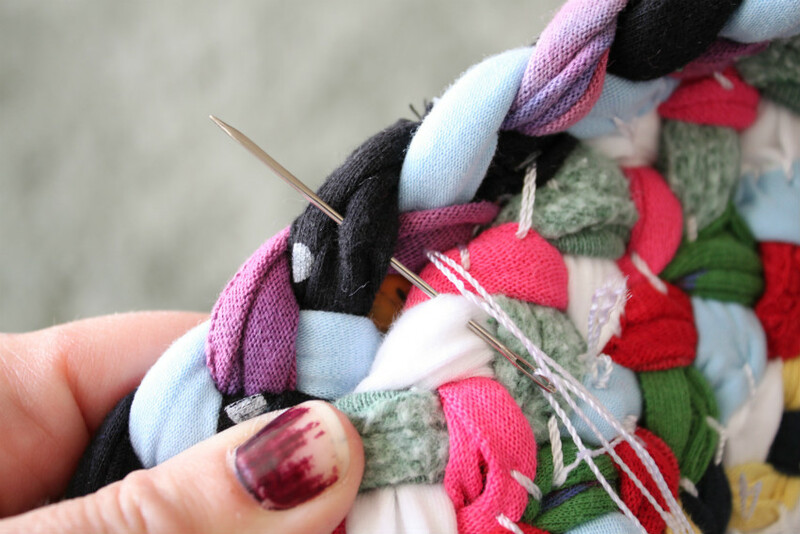 You will want to start threading your beads on only after you have finished enough braiding to make the bottom of your basket, where you don't want beads. 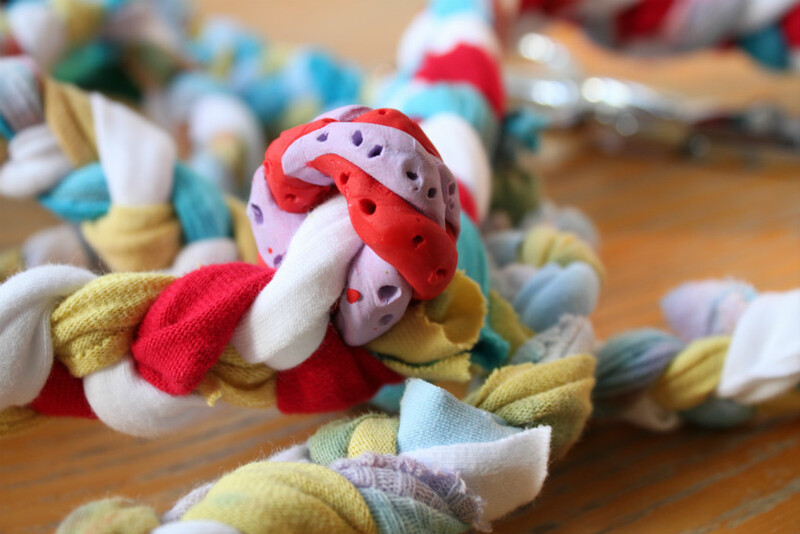 Wind the braid up like a rug on a flat surface from time to time to find out how big you would like the bottom to be. Once you start braiding what will end up being the walls of the basket, add beads as often as you'd like. It's a really nice touch. Eventually you're going to end up with an ENORMOUS BRAID! I wish I had measured it, but we were under time constraints so I didn't have a chance. It seemed like it was a block long. 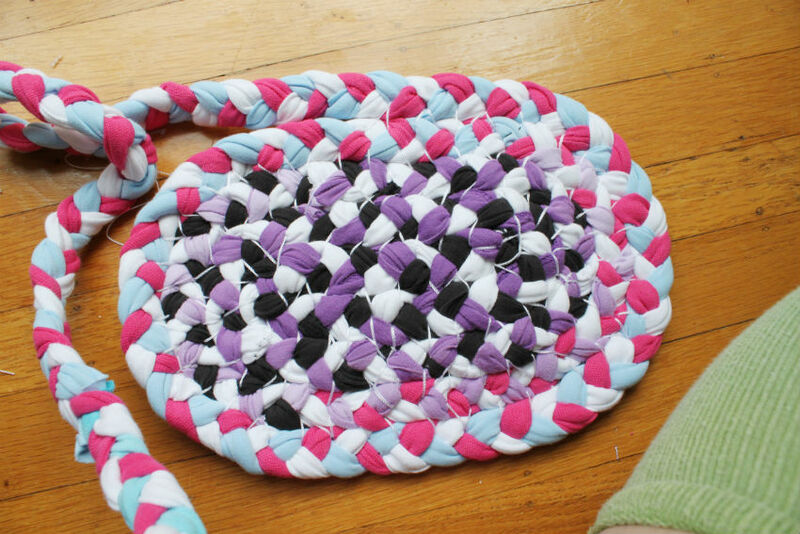 When you are ready to start sewing, fold the unbeaded end of the braid over and sew those two pieces together side by side with the crochet thread to form an oblong basket bottom, or start coiling the braid right from the get-go for a more circular bottom. As this was my first time making something like this, I didn't do a great job and the stitching is totally visible and ugly at the inside bottom of our basket. Once I started up the side of the basket I realized there was a way to stitch through the fabric so the stitching is only visible on one side. You can see that in step 5 ahead. 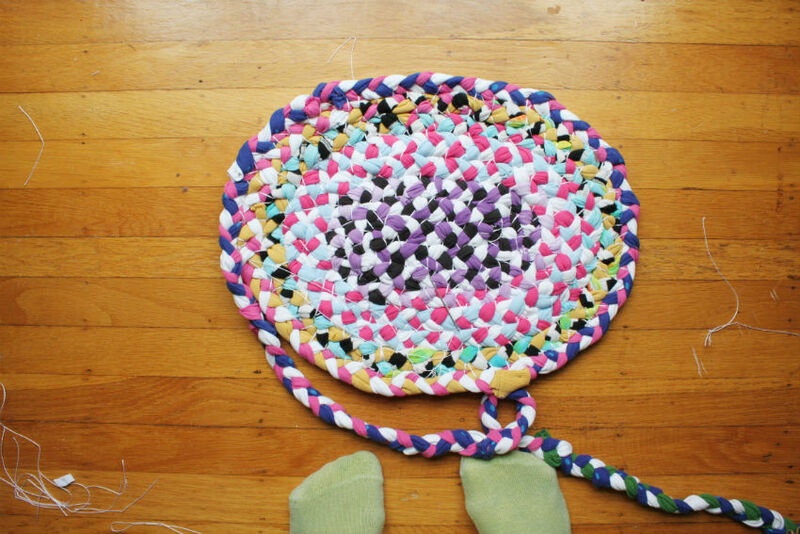 When you are ready to make the walls, turn the braid 90º into an upright position and sew to outer braid of basket bottom. That stitching is best done at the exterior of the basket. After that, move the stitching to the interior of the basket. 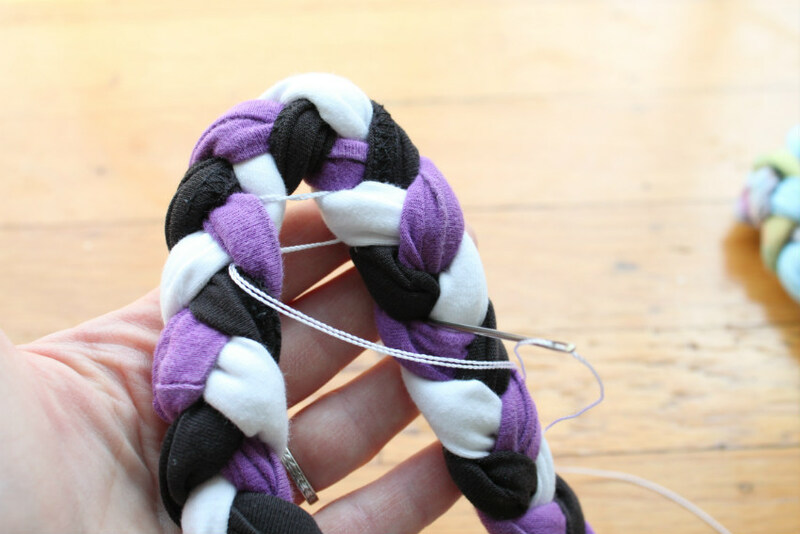 Keep stacking the braid on top of itself, sewing the interior braid edges as shown in the photos below. Take care that the crochet thread does not show through to the outside. 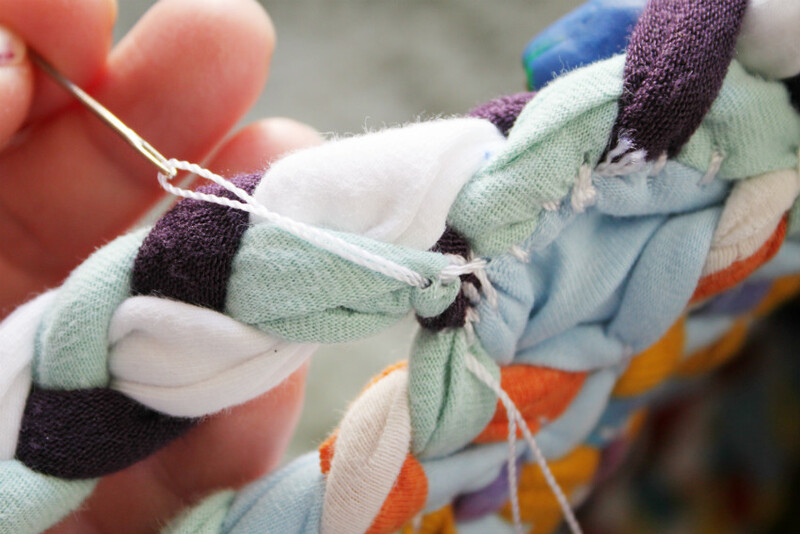 When sewing near a bead, keep your braid in position and secure all around the bead, making sure the bead stays to the exterior of the basket walls. Keep on sewing until you get the height you want! The vertical, stacked form I ended up with just happened naturally. I would like to try this again with a more splayed or salad-bowl type form. To create handles, decide where you want them to be located and how wide you'd like them to be. 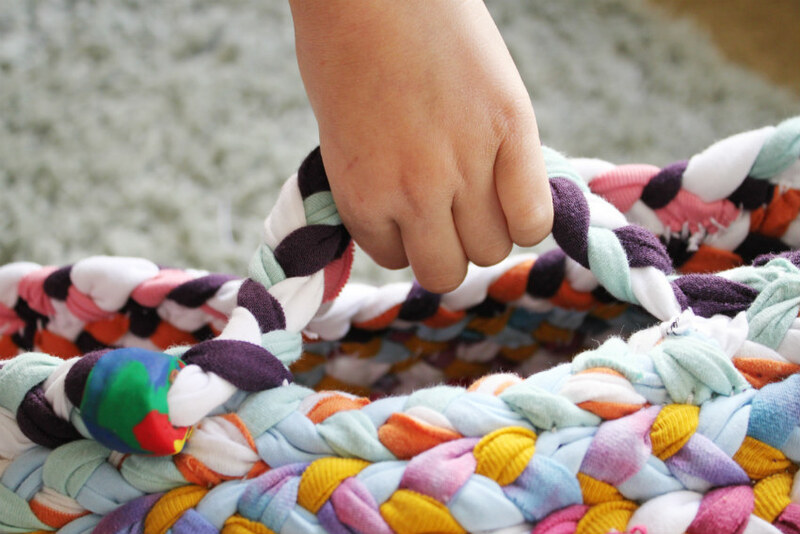 Hold the braid off of the top of the basket at the handle and add very strong, repetitive stitching at the fork in the road where the handle comes away. Leave a little slack in the handle bit, and secure it again at the other side where it meets the top of the basket again. 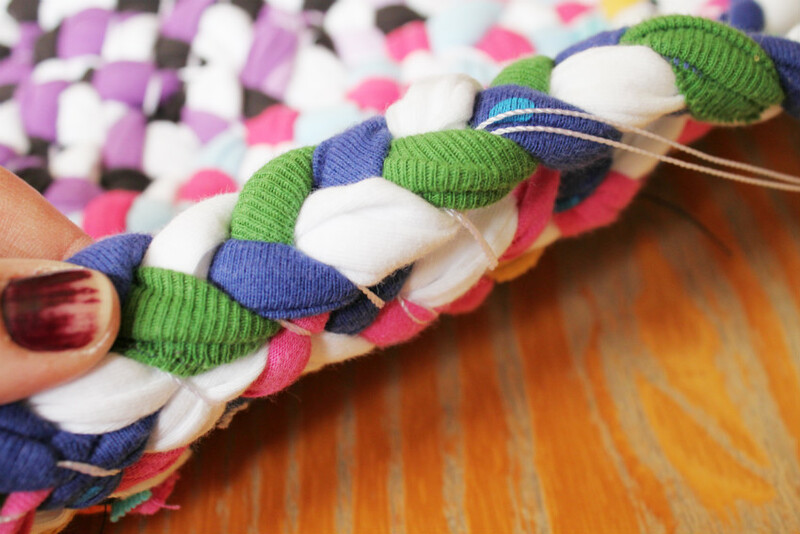 Keep sewing that braid at the top of the basket until you reach the opposite side and add a second handle. 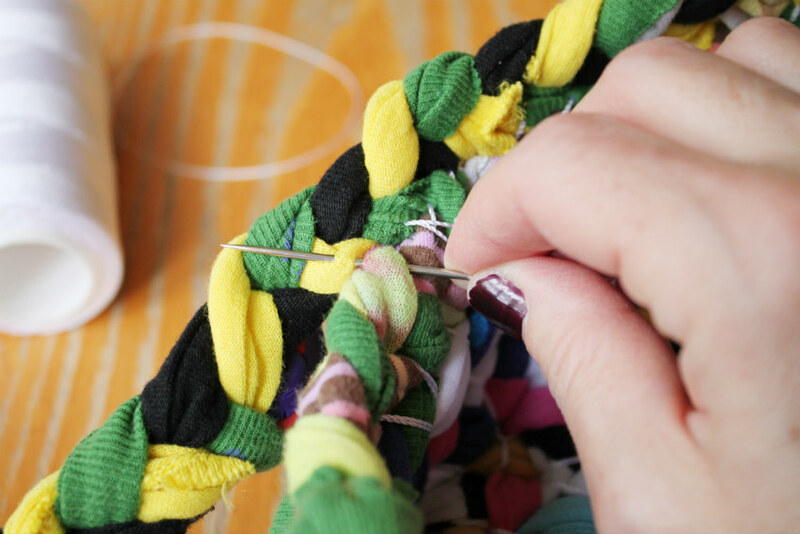 To finish up, keep sewing the braid to the top of the basket again after the second handle for a few inches, then you'll end the braid in a taper. To create the taper, cut the width of each of the three pieces of the end of the top braid to just about 3/4" wide, being sure that they are still continuations of pieces already in the existing braid. 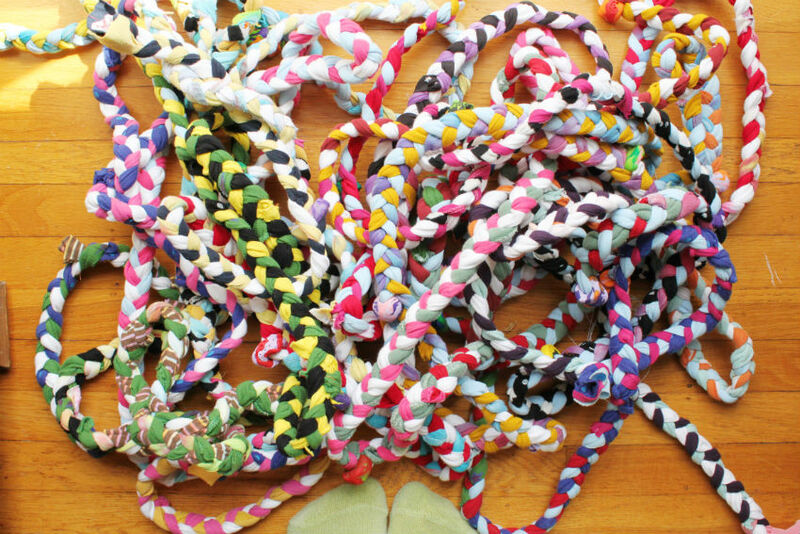 Braid these thinner pieces into a much skinnier braid a few inches long and then secure to top of basket. 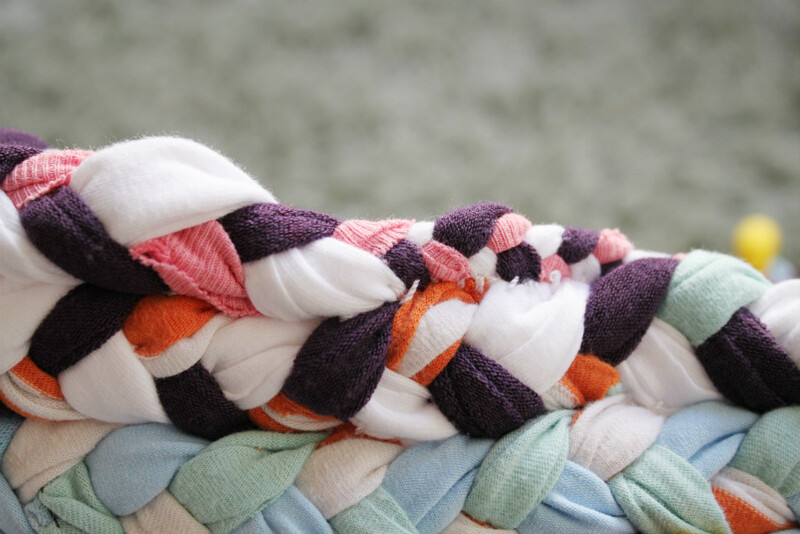 Tuck the very end of the taper into a bigger braid at the inside of the basket, and stitch to secure in place. And there you have it! I have to tell you, the sewing takes a surprisingly LONG time. Crazy long. Some fabrics were darn near impossible to push a needle through, some were like butter. This is definitely not something you can bang out in a night. Or two. Or three! Still, I'd like one for myself so I'll probably do it again, maybe using old cotton sheets and tapestries we have around. I love the random crazy colors of this, though. It's so pretty! I love it! I have a bunch of old jeans thinking I would try to make some fancy jacket that didn't look like some bad 70's flashback. 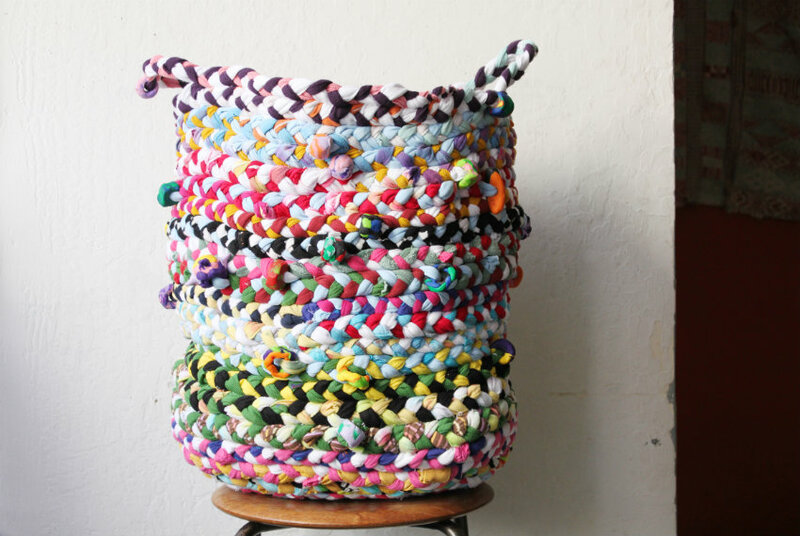 But maybe using the jeans for a braid basket? I see busting lots of needles though! WOW. you are my DIY hero. No way, lady. No way! 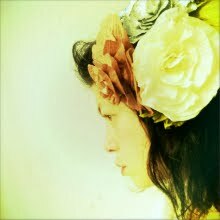 I <3 your projects! This is so cool! I work with kids, and I could see this being a great group project for them. Yours came out so beautifully... thanks for the idea! Thank you, Cyndie! Thank you for taking the time to comment, and let me know if you ever do make one! Oh wow - this is INCREDIBLY beautiful! I love it and would totally love to tackle a similar project - maybe in shades of white, black, cream? Thank you, Jordana! That sounds so pretty. I wondered how it would've looked if it wasn't so crazy with the random colors. PLEASE follow up here if you do make one, I'd love to see it. I'm going to check out your blog tonight! This post inspired me! I spent today's cold, grey day to tackle this DIY. I am almost - almost - done. A few more rows to stich and it'll be done. Let me just say - thank goodness for thimbles! Saved my finger from lots of pokes. :) I did mine in black, white and red with some of my old clothes that were headed for donation. I will post or send pics hopefully this week. Anyway - I have a question for you. Mine is about 10 rows high and I think I have about 5 more to sew. It's getting floppy though and so I was wondering if you used anything to structure/stabilize your basket? I don't know what I'm going to fill it with yet - but if I leave it empty I'd like it to stand up as much as possible. Any ideas? Thanks again! I REALLY LOVE it! (And thanks for being honest about the time commitment - it's a long project - and I even used adult clothes and a sewing machine!) . p.s. Thanks for checking out White Cabana. Hi Jordana! I cannot wait to see how yours came out. I know what you mean about the thimbles...I didn't have one and my fingers were calloused for weeks afterwards, literally! I also was silly and tired and pulled the needle a bunch of times with my tooth and made a little divot in it so now I can't cut a piece of string with my teeth on that side anymore. Foolish! Thank you for your sweet comment, Annick! This is so beautiful! I'm the least crafty person ever but I love this so much. I have a lot of fat quarters of regular ole fabric. Do you think that this would be doable with that? Just took all my old t-shirts and made them into a quilt....sure with I would have saved the backs now! So I finished mine. I had some trouble with it closing in on me as I went up. I had to rip out a few rows and then I finally got it right but the bottom is still wider than the top! Oh well I think my yarn and knitting has a nice little home in it. That was my trial. 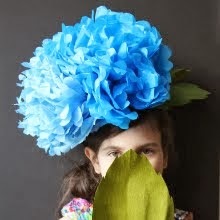 I think I will do better next time when I make one for my daughter'a preschool teachers! Is there a way to post a pic? Hi Bekah! It is really hard to get it perfect. Mine is shaped more like an hourglass when nothing is in it. Challenging! 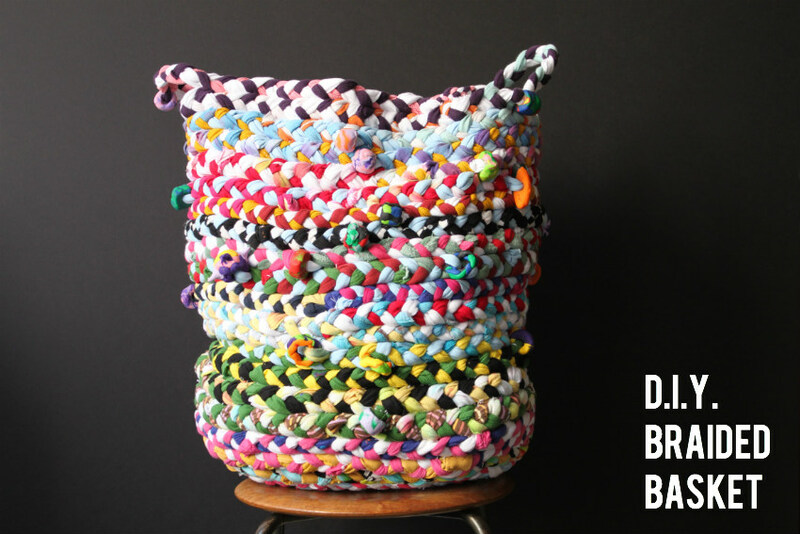 I wonder if wrapping the braids around something like a cylindrical waste paper basket while sewing it would work. You'd have to sew it inside out I think, but something to think about. I would love to see a photo. If you are on Instagram, take a photo and tag it (at) sfcornerblog, or just email me a photo at sfcornerblog (at) hotmail (dot) com. Thank you, and happy new year! Thank you for sharing a great idea, love the basket. wondering how important is jersey fabric, can it be done with t-shirts only? Hi Tejal! Sorry for the delayed response. I am not sure what other materials could be used. I thought it would be easy to sew the jersey, but because of the way it pulled it was actually hard to get through with my upholstery needle a lot of the time. I wonder if I had used a regular needle if it would've been easier. I think maybe you should just do some test braids of the fabrics you are thinking of and see if it's going to drive you crazy or not! PLEASE let me know if you make one, I'd love to see it!